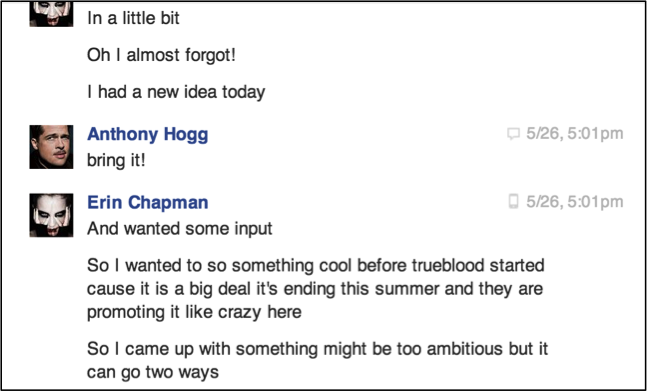 A brainstorming session followed and his initial idea was a compilation of vampire deaths from movies, which then blended with my idea for a tribute to True Blood. The next step was determining a theme. We toyed with a funeral slide-show style video of deceased characters, accompanied by a New Orleans funeral jazz band—a mock eulogy. After debating it, we decided this angle was too somber and didn’t represent the essence of the show. Anthony suggested we reference WatchMojo videos for inspiration, which I thought was brilliant! They had that pop that we were looking for. I got sidetracked finishing up an article for our site, so the video sat on the back burner until we discussed it again on June 6. We came up with six potential video topics and set a pre-production deadline of June 8 due to time constraints. I wanted our video released before June 22 to coordinate with the show’s premiere and its accompanying hype. Anthony insisted it was my baby so I had two days to decide on a theme. 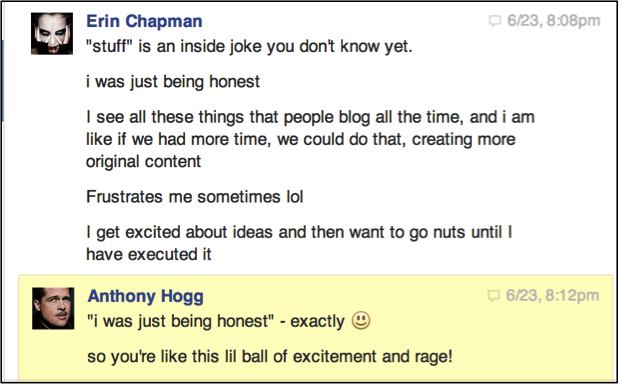 I was feeling the pressure, as it was the first video for the site and our YouTube channel. I felt stressed, like a parent picking baby names! Neither one of us had ever made an online video of this nature, so we were in uncharted territory and flying by the seat of our pants. The learning curve was also upped because I just started using iMovie a week prior. We also had to contend with geographic obstacles: I live in Vancouver, Canada and Anthony lives in Melbourne, Australia. So, major time zone differences, plus all our communication is by phone or Facebook. You gotta love technology! You want a challenge? Try making a video—or working on projects, for that matter—with someone that isn’t ever in the same room with you! Why even attempt a video? Well, for me it was all about the challenge. I like to push myself outside my comfort zone, just for the hell, of it to see if I can do something. I want Vamped to have it’s own unique videos and since the site is still growing, that blank page keeps staring at me relentlessly. I know we are only two people, but we aspire to eventually have enough exclusive content so we no longer need to share other people’s pages, blogs or sites on our Facebook page or Twitter account. I want to see other people share our articles and posts, but I have to keep telling myself: baby steps, for now! We decided on “Top 13 True Blood Deaths.” Why 13? I was inspired by a site Anthony showed me a couple weeks back called 11 Points, whose motto is “Because Top 10 Lists Are for Cowards.” Challenge accepted! Also, “13” is a nice horror-related number. We quickly discovered the difficulties creating video compilations with narration on top. You need to determine which clips to use, how to splice them together so they synchronize flawlessly, choose title slides and transitions and most importantly write the script for the voiceovers. The problem is, if you wrote the script first, you had to fit the video to the content, and if you did the video first it was the opposite. We went back and forth for a few days until we had a completed video. The final task was to write a script, which involved researching the episode details for citing purposes, and ensuring we had accurate background info. Anthony and I felt like the end was in sight until I showed the script draft to a friend who’s a total fan of the show. Her feedback was invaluable. She insisted the script was too long; that we were treating the video like an article—not a video. Narration would need to be minimal, so viewers wouldn’t be too distracted from the clips. Also, we didn’t need to explain so much back-story, as it would be “dumbing down” things too much for other True Blood fans. “The point of watching a video is to be entertained, not bored,” she said. Suffice it to say, her comments threw a spanner in the works. This happened on Friday. Our deadline was Sunday. Australia is a day ahead of me, so that meant we also lost another day. On Saturday I finished my 9 hour shift and when I got home we decided to start from scratch again. Yes you read that right! We both knew the time constraints, but there was no way we’d be happy with the final product. Part of this may be our perfectionist personalities taking over, but we jumped in feet first. We diligently worked until about 10pm and realized we had to cut the number from 13 down to 6. 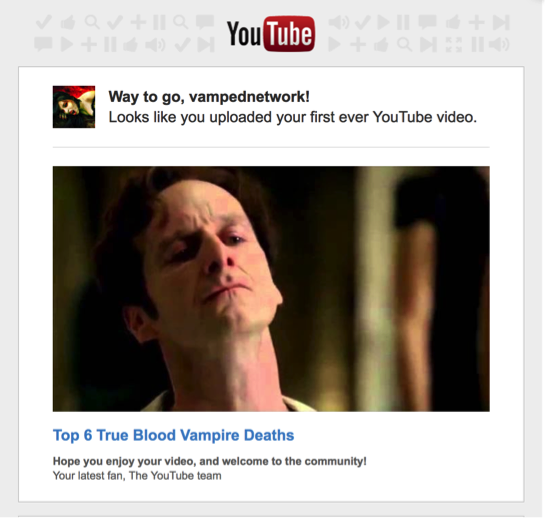 We also made the executive decision to alter the theme to “top vampire deaths” only. I think in total that night we spent at least 5 hours on the phone, discussing the video back and forth. The script was whittled to its bare bones, often on the fly, and numerous edits and discussions on transitions and inserts were made. I managed to tough it out until about 5:30am in the morning when exhaustion finally kicked in. Anthony kept working while I caught some snoozes. By 6pm, my time, we joined forces again and the clock was ticking! We still had a few tweaks left to do, but I am proud to say by June 22, 8pm, we had uploaded our first video to our YouTube channel—just in time for the show’s premiere. Now, it was time to spread the word! Yes, dear readers, we basically completed the entire video in less than 24 hours! We both felt relieved. It felt like I just finished a bloody marathon! I was so proud of us. I was on a personal high I couldn’t even put into words. We received positive feedback from a number of people—”Your video was awesome. I shared it too, excellent job :)”, “Wow, what a great video! Nice compilation, totally bloody, gory, muahahahaa!”, “My fav [sic] is Eric sucking guys heart like juice carton”, “Who does the voice over 🙂 Really cool video btw :)”—and I, personally received some compliments on the voiceovers, which surprised me as I wasn’t too keen on doing them in the first place. The results of our hard work as of writing this article are: 308 views on YouTube, with 5 new subscribers; 456 organic views from our Vamped’s Facebook page; 23 shares on Facebook; and 9 retweets and 11 favorites on Twitter. The other bonus is we simultaneously promoted my Vamped article “Why Has True Blood Been So Successful?” As of this writing, it has been viewed 686 times. In the meantime, thanks for watching!